TPI Insight is two days of special training for travel agents. It’s time again for TPI Insight at the headquarters of Travel Planners International. TPI Travel Agents gain insight to the ins-and-outs of the travel business, how to use all the available tools TPI offers, and meet important BDM’s from some of the greatest vendors in the travel business. The first day welcomed Melissa Watt, Travel 2 Sales Manager, Florida, Javier Yataco, Business Development Manager, Carnival, and Vincenzo Marsala, Business Development Manager, MLT. 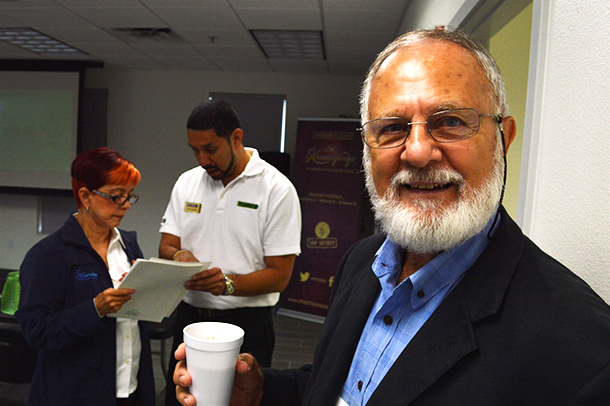 David Gray of Golden Eagle Cruise and Travel is a TPI Insight Veteran. The new TPI headquarters was designed to accommodate special training. For TPI Insight, travel agents enjoy a discounted price at the nearby Sheraton hotel, and the training fee includes breakfast and lunch. For breakfast on the first day, travel agents enjoyed spinach & artichoke and spinach & bacon egg soufflés, and strawberry granola parfaits. 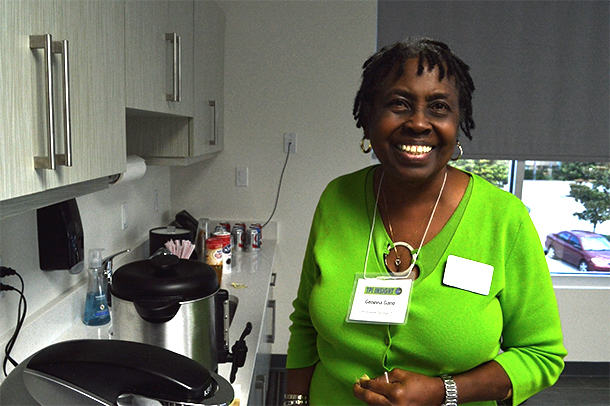 A catered lunch was a convenient and enjoyable break in the program. Chicken parmesan, green beans, pasta salad, green salad, and fruit salad was topped off with decorative brownie bites. 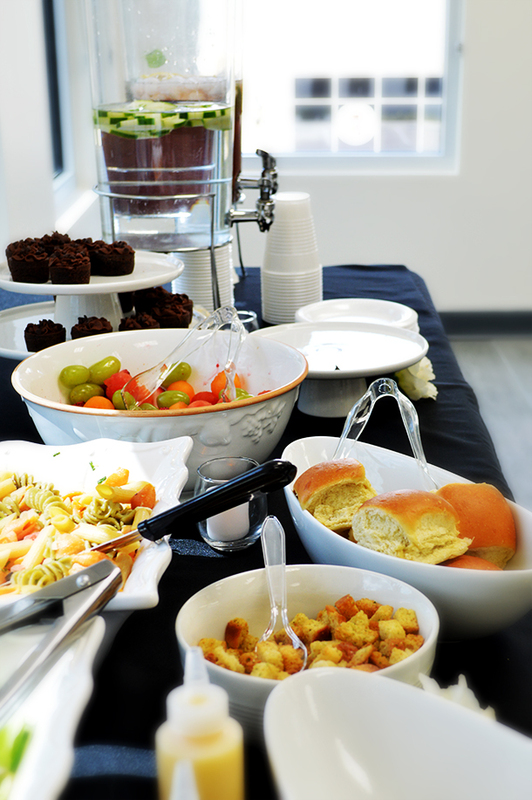 Refreshments are available at all times to accommodate all of our guests. Genevia Gano of Geans Travel having a fabulous time. The first day of TPI Insight included a class about the TPICENTRAL basics, booking air, C/T and helpdesk. 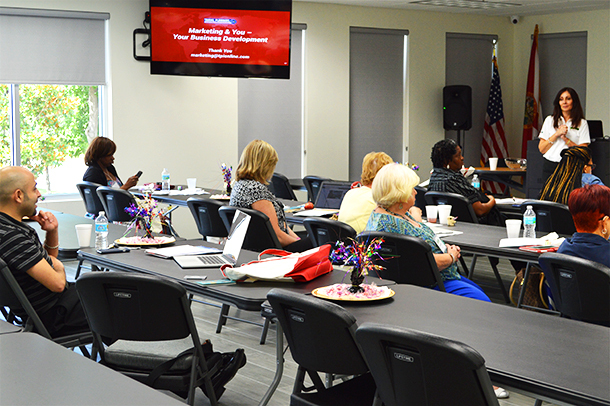 Next Melissa Watt, Sales Manager from Travel 2, shared unique travel insight with the agents. This was followed by an Accounting 101 class, turned into a fun and educational hour by TPI’s own Dennis Aguilar. 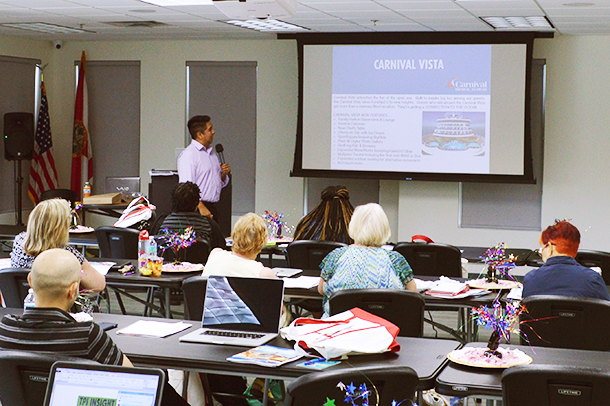 The afternoon had a fresh start with Javier Yataco, BDM of Carnival Cruise Lines. He always knows how to jazz it up! Vincenzo Marsala, BDM of MLT, followed with a great presentation. TPI agent Hazel Carlson of HGS Travel, thought the first day was “Great! And although I’ve been selling cruises for a long time, I learned a lot of new things about Carnival.” TPI agent Lucy of See Cruises and Tours, thought it was “great to learn that you don’t have to fly to enjoy a cruise in Hawaii with Carnival”. The first day of TPI Insight ended with a small intimate dinner party at the Sheraton Hotel. Vendor BDM’s, travel agents and TPI employees were all invited to join. It was nice to freely chat and mingle with dinner provided by TPI: Chicken or Salmon with loaded potatoes, asparagus, salad and an open bar.